The much-anticipated reports into the Blunkett affair will not have been happy reading for either David Blunkett or the prime minister. The prime minister, through his official spokesman, may have insisted that Sir Alan Budd's inconclusive report into the visa affair draws a line under the episode. 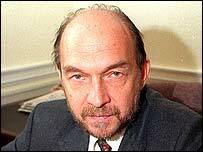 And he may continue to stand by Mr Blunkett, again claiming that his integrity is still intact. 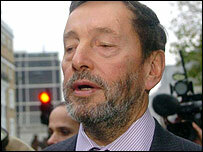 But his spokesman fell short of claiming Mr Blunkett had been exonerated by the Budd inquiry. And the opposition parties have lost no time in turning on the government, with Tory leader Michael Howard branding it a grubby government and claiming Mr Blunkett had lied. It was the clearest possible statement of intent that the opposition is not about to stop worrying at this bone and that it will be fed into its election campaign themes of trust and integrity. The problem for the government is that Sir Alan found it impossible to answer the key question at the heart of the affair - did Mr Blunkett personally order the fast-tracking of the visa application by his ex-lover's nanny? His report came just moments after Commons watchdog Sir Phillip Mawer found the ex-Home Secretary had broken the rules covering the use of rail warrants and that he should have been aware of those rules. Mr Blunkett has already apologised for his "mistake" and repaid the money. That was embarrassing enough. But the allegations over the nanny visa were more serious and had already led to Mr Blunkett's resignation after Sir Alan discovered the application had indeed been fast-tracked. Yet Sir Alan could only find that there was a "chain of events" linking Mr Blunkett to the fast-tracking of the visa. He could, however, only deliver what he described as an "open verdict" on Mr Blunkett's involvement because he did not have enough direct evidence to form a more comprehensive finding. And the reason he did not have that evidence was simply because key faxes were no longer in existence and officials could not, understandably in his view, recall all the events of 19 months or so ago. None the less, Sir Alan had enough to state that there was a chain of events that linked Mr Blunkett to the Immigration and Nationality Directorate decision to speed up the application. And he suggested there were just two possible explanations. Either Mr Blunkett was seeking special help for his lover, Kimberley Quinn's nanny, or he was raising the case as an example of the poor performance of the IND. Sir Alan gave "open verdict"
He did add that it was likely that any official seeing a specific case being highlighted as an example of a general problem might well have led to that specific case "being taken seriously". And Mr Blunkett has now added that he "made no bones about the fact" that he was raising the issue "on the back of the information that Kimberley Quinn had given me". The opposition parties are frustrated at the inability to come to firm conclusions and have, as a result, demanded a full judicial inquiry to allow a judge to take evidence under oath. 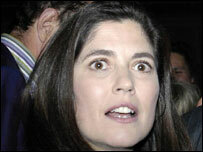 They believe that would help clear some of the "collective amnesia" over the details of the affair. This is bad news for the prime minister - visiting Iraq as the reports were published - who wants to move on from this episode. The lack of a firm conclusion means the demands for a further inquiry will continue. And Mr Howard is not about to move on. Opposition MPs are also questioning whether it had been wise of Mr Blair to declare before the Budd inquiry started that it would exonerate Mr Blunkett. Or for him to state that the former Home Secretary had resigned with his "integrity intact". And failing a further inquiry, those two explanations offered by Sir Alan are left hanging forever over Mr Blunkett's head.